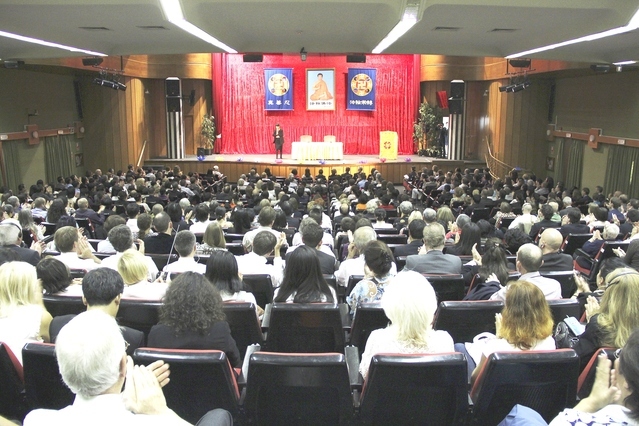 The 2014 European Falun Dafa Cultivation Experience Sharing Conference was held in Madrid, Spain, on October 5, 2014. Master Li Hongzhi, the founder of Falun Dafa, sent a greeting, encouraging practitioners to learn from each other and remain diligent. He also reminded practitioners to overcome hardships to save more people. Practitioners from 35 European countries attended the annual event, which was held this year at the School of Medicine auditorium, at Complutense University of Madrid. The countries represented included Spain, Greece, the UK, France, Germany, Russia, Austria, Switzerland, Sweden, Italy, Belgium, Finland, and others. 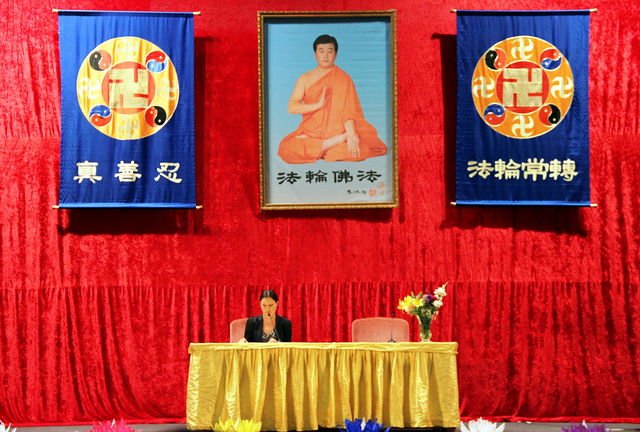 Twenty-four practitioners shared their experiences and understandings on many topics, such as studying the Falun Dafa teachings, personal cultivation, and explaining the facts about the practice. A Spanish practitioner learned a lot when she got involved in promoting Shen Yun Performing Arts. She said, for example, that the most important thing for a practitioner is not what you do, but how you do it. She came to understand how much heart you put in a project is an actual reflection of your xinxing level. That means practitioners should do their own parts well, because that is what Master expects. She also learned to let go of herself and pay more attention to the strengths of other practitioners, so that everyone can work together as one body. A Swiss doctor who originally came from Xinjiang, China, once struggled with numerous illnesses. She lost hope when all attempts to cure her failed. However, three days into her practice of Falun Dafa, all of her illnesses and discomfort disappeared. This miraculous experience made her determined to cultivate. An expert in underwater engineering from Sweden shared his understanding about assuming responsibility and following the path arranged by Master. The nature of his work requires extra precautions, since any mistake can mean loss of life. This made him unwilling to take risks in other areas. After he began practising, he helped his wife, also a practitioner, with projects, instead of taking the lead in new tasks. Through consistent Fa-study, he realized that he needed to step out of his comfort zone, and take on more responsibilities in validating the Fa. A Chinese practitioner from Sweden recalled an argument she had with two other practitioners that lasted for a long time. She then remembered what Teacher said, and felt bad about her behaviour. She apologized to the other two sincerely, “I am really sorry for what I did. Let us hold hands together to assist Master with the Fa-rectification.” The other two practitioners were touched by her sincerity, and they all had tears in their eyes as they held each others' hands. “By truly cultivating and looking within, we practitioners will be able to work together as one,” she said. Two practitioners from the UK shared their experience of holding the Art of Truthfulness, Compassion, Forbearance International Exhibition across Europe. This required practitioners in different regions and countries to cooperate closely. During the project, practitioners improved their xinxing, consistently made progress in their cultivation, and overcame interference. As a result, the artworks were exhibited in nearly 400 different locations in 30 European countries, enabling tens of thousands of people to learn the facts about Falun Gong. Touched by the artworks and practitioners' efforts, the mayor of Cardiff, the capital and largest city in Wales, UK, said at the opening ceremony of one such exhibition, that anyone, any human being, who came to the exhibition would be moved. A UK practitioner has clarified the facts about Falun Gong to people in London's Chinatown for a long time. When she first started doing it several years ago, she was fearful and did not know what to do. Nonetheless, she believed that Master's arrangement must be the best. Through the years, she has let go of fear, her attachment to comfort, and her competitiveness. “When we really have compassion in our hearts, we will be able to save more people.” She and other practitioners have since made London's Chinatown an important place for people to learn about Falun Gong. A Russian practitioner clarified the facts by distributing the Chinese version of the Epoch Times newspaper. She and several practitioners have been doing this since 2002. They have had to travel long distances in all kinds of weather.